Scientists love islands because the processes of evolution on islands are simpler than they are on more complex, much larger continents and thus more easily studied. I have made the point that the islands of Sao Tome and Principe are very poorly known, but what we do know is very exciting. One evolutionary pattern that seems to consistently appear on islands is the phenomenon of gigantism; for some reason certain successful colonizers become very large on islands: for instance, think of the tortoises on the Galapagos Ids. or on Aladabra. There are a number of hypotheses that attempt to explain this phenomenon, but none is particularly compelling; nevertheless, the pattern exists and is very evident on the oceanic Gulf of Guinea Islands. The composite image below illustrates just a few of the giants on Sao Tome and Principe. Think of potted plants for a moment… how large is a begonia? The central plant in this composite image is the largest species in the world, Begonia baccata. 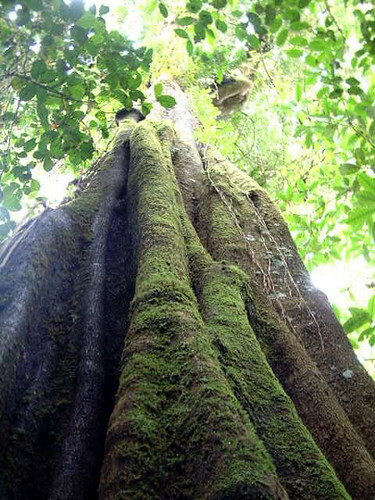 It is found only on the island of Sao Tome and reaches 10 meters in height! This particular specimen graces the southern shore of Lagoa Amelia at about 1480 m elevation – my head comes up to about flower level on this old friend (I am 6′ tall); these enormous plants are common at higher levels. The two birds figured are also giants: the yellow one on the right is the world’s largest weaver. Ploceus grandis,. and the one on the left is the world’s largest sunbird, Dreptes thomensis; both endemic to the larger island of Sao Tome. This is a good point at which to mention that island dwarfism is also an observable phenomenon here as well, and the world’s smallest ibis, the Sao Tome Dwarf Ibis, Bostrychia bocagei is also an endemic. 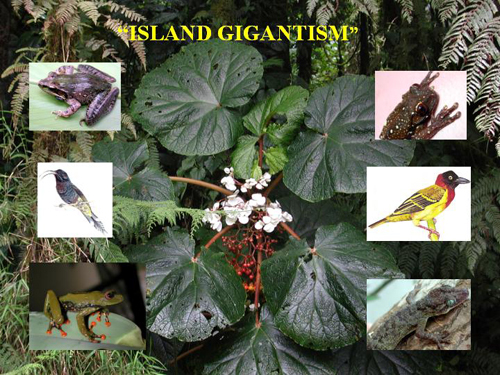 The other critters in the collage, the frogs and the lizards, are all endemic giants but I will deal with them later. It is important to bear in mind that when we call a species a “giant”, we are describing its size compared to all of its other relatives only; such a species may not appear to be a giant at all, in our eyes. The Sao Tome Giant Treefrog, Hyperolius thomensis, and I go back a long way; back to when I was writing my doctoral dissertation many years ago. This sapo (as all frogs are called on the islands) is endemic to Sao Tome only and is easily the largest member of its genus (Hyperolius)- females reach lengths of nearly 50 mm.from snout to vent! Nearly all of the original material from which this species was described in 1886 was destroyed in the fire in Lisbon. But I managed to find four remaining specimens, two in Vienna and two at the Natural History Museum in Vienna, allowing me to treat them in my dissertation. In 1988 and again 1990 more specimens were reported by a Swiss worker, but her published locality data are very general, if not vague, and it turns out that most of the material she worked on was collected by locals at her request prior to her arrival. During GG I, we visited most of her reported localities, finding nothing until we finally got lucky. Now, I can state that this most flamboyant of treefrogs is currently known for certain from only a single locality! Our work in GG I, II and III has confirmed that this marvelous critter is known only from higher elevations (above 1000 m), inhabiting the canopy of old secondary or primary growth trees on steep slopes. And it appears to breed only in the water-filled holes in trees with fluted bark or buttresses. 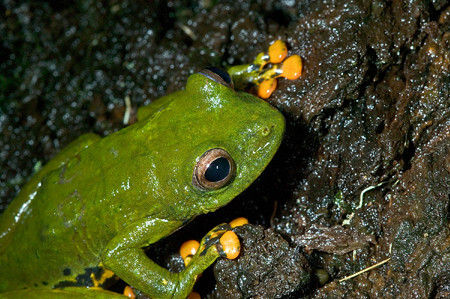 This is a rarity – in Africa, only 9 other frog species are known to breed in phytotelmata (scientific word for treehole). But it makes sense. 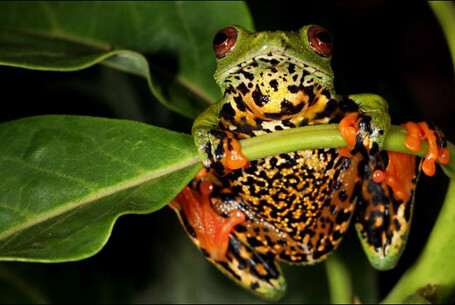 Most frogs lay eggs, which develop into free-swimming, gilled tadpoles, which then metamorphose. Although there are many fast moving rivers on the steep slopes of Sao Tome, these are far to swift for breeding; still bodies of water simply do not exist. So, H. thomensis has adapted to breeding in ephemeral, rain-filled holes in the trunks of very large trees! All of the other frogs native to the islands utilize slow moving or still water for reproduction. 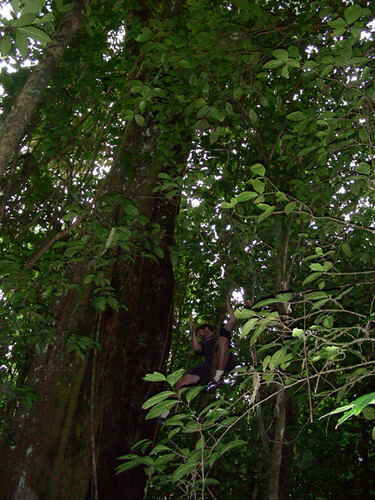 This is the only tree in which we have collected the Sao Tome Giant treefrog. It is at about 1100 m on a high ridge, and we return each expedition to check its status. 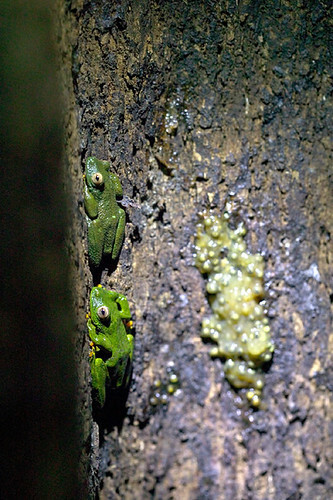 Adults are usually present but there are always eggs and tadpoles at different stages of development in the holes. Tom and Rebecca, our botanists, could not identify this tree – it is simply too tall its see its canopy, and moreover it is festooned with epiphytes. Wes Eckerman, our photographer tried to climb it, and then tried to climb an adjacent tree to see if there were more holes, but the tree is just too big in girth to handle; with our friend Jose Clara, we tried to erect a crude ladder to examine a hole farther up the trunk but to no avail. I do not mean to imply that this species is restricted to this tree. We have heard the species calling at night from high up in the canopy and reasonably certain that it is pretty widespread, at least in the high elevation forests we have visited – I suspect it is present on Sao Tome anywhere the trees are large enough and that. of course. means upslope above the former Portuguese plantations. What is different about this single documented tree is that it is the only one whose rain-filled holes are within our reach – there are undoubtedly more holes in many more trees that are too high for us to access. 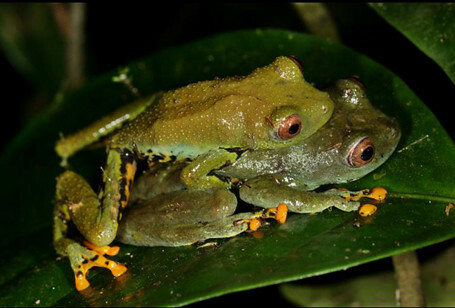 I am left with the notion that given its restricted range and peculiar breeding biology, the Sao Tome Giant Treefrog is a classic indicator species; its presence means healthy mature forest. If I were to choose an icon to symbolize the dogged persistence of pockets of nature in the face of man’s depredations and at the same time the attitude, beauty and whimsy of the citizens of Sao Tome and Principe, it would be this gorgeous island giant. 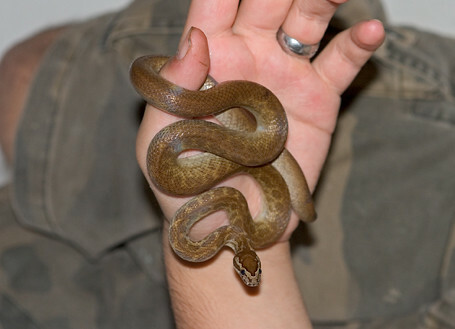 Josef, my former student, informs me that he has already seen the name of this species on a price list in the pet trade in Europe. If you wonder why I have not described the location of this tree is in more detail, now you know. In the last posting, I promised you a picture of the cobra jita of Sao Tome. Here are shots of both island forms, which are currently considered to be the same species. Not only do these critters look different from those on Sao Tome (stripes vs. patterned blotches), they act differently as well. 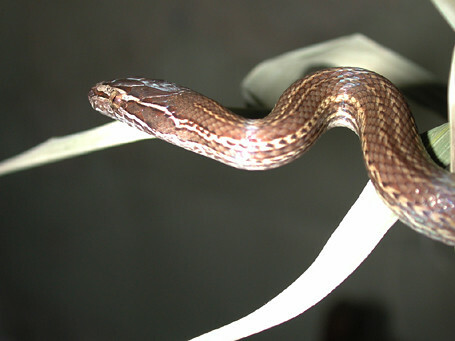 On Sao Tome, cobra jita appears to be strictly nocturnal; during GG I and GG II we easily found them at night by first listening for the loud choruses of oceanic treefrogs (more about them later). So far as we know, the Sao Tome jita largely feeds on these frogs while they are breeding and is strictly nocturnal; to see at least ten of these snakes in a single night under the right conditions is not uncommon. 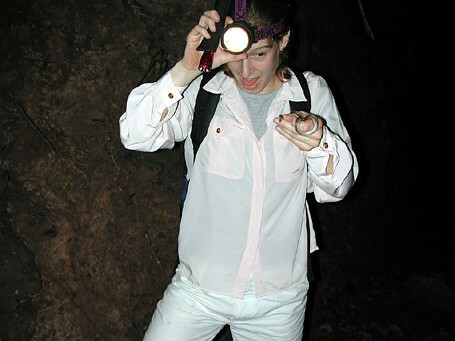 R. Stoelting, my grad student, with her first Jita – GG I, RCD phot. After our week on Principe, however, I am prepared to say that that jita is diurnal and although we will not know until we check stomachs, I think it feeds on lizards and small rodents. We even located a chorus of treefrogs behind Bombom but failed find a jita, nor did we ever find one during our night hunts. Only time and careful study of morphology nd DNA will tell us how closely related these two island snakes really are.Thanks to Caitlin D. for her generous donation. We are doing what we can! PARTNERS We gratefully acknowledge the support of the Research Investment Fund of the California Academy of Sciences, the Société de Conservation et Développement (SCD) for logistics, ground transportation and lodging, STePUP of Sao Tome http://www.stepup.st/ and especially the generosity of three private individuals, George F. Breed, Gerry F. Ohrstrom and Timothy M. Muller, for making GG III possible. Thanks, Velma. Large parts of both islands are in the Parc Natural Obo… note it is “natural” park, not “national” park.. not quite the same thing. So much to know from the mother earth and we know so little and on that span of life is less yet we r investing in quarreling and fighting. Previous Previous post: The Race Continues: We Find Jita! Island Biodiversity Race Blog at WordPress.com.